Wild Love, originally called Angel Child was chosen as the follow-up to the number 3 hit single, Alright Alright Alright in the autumn of 1973. As Angel Child, it made the hairs stand up on the back of my neck when I first heard it at the Black Swan in Sheffield – it still does! Although it wasn’t as big a hit, it still made it into the singles chart at 32, despite receiving little or no radio play. And as far as we know, there were no television appearances which was strange considering that it was the follow-up to Alright Alright Alright. Tracks: Wild Love/Glad I’m a Rocker. “When we were requested to do another Top Of The Pops, Harry Simmonds demanded a higher fee than the BBC normally paid and we were told that unless we were in the top ten with our follow up we would not get to be on the show with it. “Also, this was at a time when because of a strike only one music paper got to be published and it happened to be the one where we were lower in the chart”. Camberley gig rehearsal, October 2015. What this one does is stomp along, with the very likeable Ray Dorset doing his wild animalistic noises and vocal refrains out front for the customers. Devonshire Hall, Leeds University 1973. It’s full of riffs, hey-hos, repeated title phrases, and bits of talking. It’ll hit the charts in a big way, but for me doesn’t have the same instant appeal of ‘Alright’ (three times over). “A hit then…but not entirely my cup of ‘Rosie Jerry’. Along with the bloke in Nazareth, Ray Dorset has one of the better scream voices, and this record has all the stops and starts and places for the crowd to join in that go to make a disco ’73 smash. 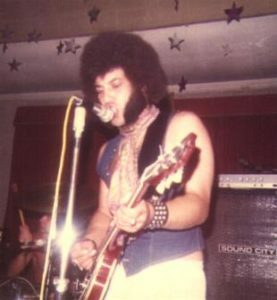 Ray Dorset hollers another hit from the depths of his hot rasping throat, while the band boogies – but gently. Listen to the bouncing beat and tell me if it isn’t worth a set of silver tea spoons and treble stamps”. 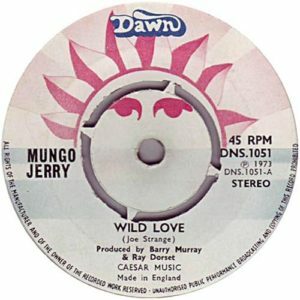 The b-side of Wild Love was the rocking Glad I’m a Rocker with Johnny Cook on piano, Bob Daisley on bass and the late Dave Bidwell on drums. There are also two brand new DVD’s – 24 Days, the Mungo Jerry documentary filmed during a tour of mainly Germany in 2016 and a live performance from the Bansko Jazz Festival. 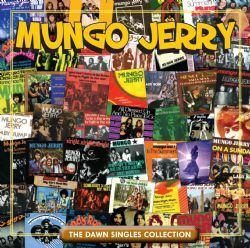 Available through CHERRY RED RECORDS, is a collection of all of the A and B-sides of all of Mungo Jerry’s singles for the highly collectable Dawn record label. The set includes the muti-million seller, In The Summertime, Baby Jump, Lady Rose, and of course Wild Love.